Film Festival: New location, new voices for Damn These Heels! "Independent ethos" guides works at SLC's LGBT film festival. Jenn Harris and Matthew Wilkas star in "Gayby," the opening-night film of the 9th annual Damn These Heels! LGBT Film Festival, July 13-15 in Salt Lake City. (Courtesy Hubbhobb) Country singer Chely Wright makes an appearance as Grand Master of the Chicago Gay Pride Parade in 2010, in a moment from the documentary "Chely Wright: Wish Me Away," screening at the ninth annual Damn These Heels! LGBT Film Festival in Salt Lake City. 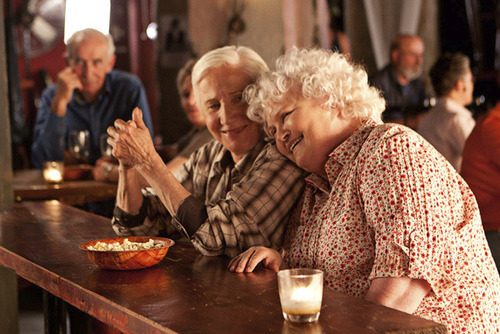 Courtesy First Run Features Courtesy photo Olympia Dukakis (left) and Brenda Fricker play an aging lesbian couple in "Cloudburst," one of the films screening at the ninth annual Damn These Heels! LGBT Film Festival in Salt Lake City. Salt Lake City's gay and lesbian film festival marks its ninth year with a new location, new dates and a new emphasis on smaller, independent films. "These are unknown titles that people are not necessarily familiar with," said Levi Elder, who directs the Damn These Heels! Film Festival. The festival brings 11 feature films celebrating lesbian, gay, bisexual and transgender culture. The films run July 13-15 at a new location: the Rose Wagner Performing Arts Center, 138 W. 300 South, Salt Lake City. Elder said pushing the festival back to July, after a few years in mid-June, was requested by the LGBT community. "Pride fatigue" is how Elder describes the problem of having it just a couple weeks after the Utah Pride Festival, the state's largest celebration for the LGBT community. It "gives people the opportunity to recover and spend some more time with the festival," he said. This year's lineup doesn't have the star-studded Hollywood films of past festivals (last year's opener, Mike Mills' "Beginners," went on to win an Oscar for Christopher Plummer) or rely on titles from this year's Sundance Film Festival. "The films aren't so Hollywood-ready," Elder said. "They're returning to the independent ethos." Here is the schedule for Damn These Heels! 7 p.m. (opening-night film) • "Gayby" (dir: Jonathan Lisecki) • Jenn (Jenn Harris) and her gay best friend, Matt (Matthew Wilkas), decide to have a child together in this comedy that debuted at SXSW this year. Plays with the short "Even Handed," a documentary made by Salt Lake City filmmakers Samantha Highsmith and Gabriella Huggins for Spy Hop Productions. 11 p.m. • "Jack and Diane" (dir: Bradley Rust Gray; U.S.) • A romance between two teen girls  tough Jack (Riley Keough) and innocent Diane (Juno Temple)  is endangered when Jack learns Diane is leaving the country soon and that Diane has werewolf tendencies. Features animated sequences by the Quay Brothers. 10:30 a.m. • "Trans" (dir: Chris Arnold; U.S.) • The lives of transgender people in America, and the work of surgeon Christine McGinn, are highlighted in this documentary. 12:30 p.m. • "Chely Wright: Wish Me Away" (dir: Bobbie Birleffi and Beverly Kopf; U.S.) • Country singer Chely Wright is profiled in this documentary, which examines her decision to come out as a lesbian. Wright gave the filmmakers access over two years, including her private video diaries. 3 p.m. • "Cloudburst" (dir: Thom Fitzgerald; U.S./Canada) • Oscar winners Olympia Dukakis ("Moonstruck") and Brenda Fricker ("My Left Foot") star as an aging lesbian couple who escape their Maine nursing home, headed for Nova Scotia to marry legally  and picking up a hitchhiker (Ryan Doucette) going home to visit his dying mother. 5 p.m. • "Stud Life" (dir: Campbell Ex; United Kingdom) • J.J. (T'Nia Miller), a "stud" lesbian, must choose between a hot new girlfriend (Robyn Kerr) and her gay pretty-boy best friend (Kyle Treslove). 7 p.m (Centerpiece Screening) • "Joshua Tree, 1951: A Portrait of James Dean" (dir: Matthew Mishory) • A speculative drama looking at Dean (played by James Preston) just before his fame and raising the issue of his bisexuality. Screens as a same-day premiere with NewFest (in New York City) and OutFest (in Los Angeles). 9 p.m. • "Hit So Hard" (dir: P. David Ebersole; U.S.) • Patty Schemel, the openly gay drummer of Courtney Love's rock band Hole, is profiled in a documentary that examines the dark side of fame. Noon • "In the Family" (dir: Patrick Wang; U.S.) • Director Patrick Wang stars as a gay dad whose partner, Cody (Trevor St. John), is killed in a car accident, after which Cody's sister claims custody of the couple's 6-year-old son (Sebastian Banes). 4:45 p.m. • "Facing Mirrors (Aynehaye Rooberoo)" (dir: Negar Azarbayjani; Iran/Germany) • Rana (Qazal Shakeri), a cabby working to pay off her imprisoned husband's debt, picks up Edi (Shayesteh Irani), a transgender woman  leading to a dangerous series of conflicts. The ninth annual Damn These Heels! LGBT Film Festival. Where • Rose Wagner Performing Arts Center, 138 W. 300 South, Salt Lake City. When • Friday through Sunday, July 13-15. Tickets • Individual tickets to most screenings are $6, through ArtTix. A pass for the entire festival is available for $25, through the Utah Film Center at utahfilmcenter.org.